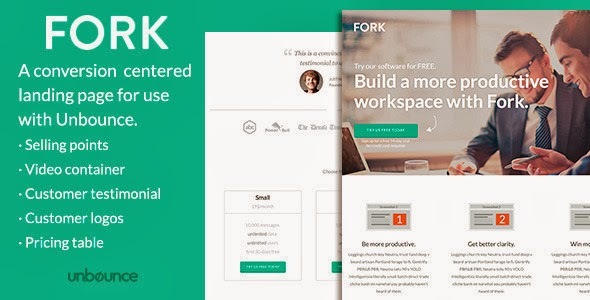 FORK is a conversion centered click-through landing page for use with Unbounce. It’s perfect for attracting new trial accounts for your SaaS service or similar. The design is clean and modern, and the template is very easy to customize. The order of elements can easily be dragged and dropped within the Unbounce editor. If you don’t need one of the elements, you simply delete that element. That way you can tailor the structure to your need. The landing page consists of: - Click to trial button - Unique Selling Points - Video placeholder - Customer testimonial - Customer logos - Pricing table. Item Reviewed: FORK - Unbounce Template 9 out of 10 based on 10 ratings. 9 user reviews.